You can read about events at this week's Strasbourg plenary session here. And with that, today's sitting comes to an end. MEPs will be back tomorrow from 08.00 BST, when they will be joined by Donald Tusk to debate last week's EU summit in Brussels. After 11.00 BST, they will vote on whether a licence for glyphosate should be renewed - ahead of a vote later this week by EU governments. The EU Commission will announce its 2018 legislative programme in the afternoon, and MEPs will also debate the killing of Maltese investigative journalist Daphne Caruana Galizia. Finally this evening, there will be a round of short one-minute speeches from backbench MEPs. This item of business, traditionally held during the Monday plenary sitting, is normally used by MEPs to make points about topical issues or stories of interest to their country or region. Labour MEP Derek Vaughan presents a report from the budgetary control committee which calls for “more precise information” on the effectiveness of an EU jobs scheme. The Youth Employment Initiative (YEI) was set up in 2013 in a drive to tackle high rates of youth unemployment in certain EU countries. It also says national authorities should make sure EU funds are not used to “replace” public expenditure, and local employers should be better used in the scheme. French Socialist MEP Virginie Roziere presents a report from the legal affairs committee calling on the EU to introduce greater protection for whistleblowers. The draft calls on the European Commission to table plans by the end of this year to introduce greater protection for both public and private sectors. It also says it is concerning that journalists divulging information in the public interest can often face legal action rather than protection. She tells MEPs there should be a "broad definition" of what constitutes a whistleblower - with protection offered on the basis of a public interest assessment. Next tonight there will be short debates on “own initiative” reports from three of the assembly’s committees, which will be voted on tomorrow. These reports are non-binding and in practice serve as policy suggestions for the European Commission, which has to initiate new EU legislation. UKIP's Tim Aker says the EU's approach resembles trying to "stop something that's already happening". Throwing "more money" at the so-called war on drugs will not work and cash would be better spent on tackling the causes of drug use, he adds. Italian social democrat Caterina Chinnici suggests harmonising national legislation and greater exchange of information between national regulators on new substances. Migration commissioner Dimitris Avramopoulos says the EU has a role to play in cracking down on "unscrupulous" gangs making harmful substances. The number of new psychoactive substances is "dramatically increasing", he says, with an average of one new substance identified every week. Europol has banned 19 this year, with eight more in the process of being banned, he says. He calls on MEPs to pass the legislation tomorrow, telling them it will send a "clear message" about the determination to remove harmful substances from the market. MEPs are now discussing proposed changed to the EU regime for monitoring new psychoactive substances – known as “legal highs” – entering the market. Many of these substances have health risks not dissimilar to illegal drugs. Under a proposed update to the rules, the process for assessing new substances will be streamlined and the time needed for states to implement EU decisions will be halved. The EU’s police co-operation agency, Europol, will also be given a greater role in determining any criminal groups involved in making or distributing the substances. MEPs have reached agreement with national ministers on the two legislative modifications required to bring in the changes, which face a final vote tomorrow. Polish centre-right MEP Dariusz Rosati says the dispute is not about cadmium itself but about the speed with which it should be withdrawn from fertilisers. He says the limits suggested by the internal market committee are "far too restrictive", and could push farmers into buying a greater amount of alternative fertilisers from Russia. However Labour MEP Catherine Stihler says an "affordable way" must be found to push farmers into making greater use of organic fertilisers. She welcomes the committee position, and says she hopes the maximum level of cadmium allowed will be further reduced in future years. Dutch Green MEP Bas Eickhout says there are "concerning facts that need to be addressed" about exposure to the metal cadmium. He rejects the idea that the proposed rule changes are too strict, adding that as things stand the proposed maximum levels would lead to a "dilution" of standards in some states. However UKIP farming spokesman Stuart Agnew says there is "no clear evidence" for a need to "crack down hard" on cadmium-based fertilisers. He says the case for lowering the limit to 20 mg/kg after nine years - as the internal market committee has proposed - "not been made". The current limit stands at 60 mg/kg - and Mr Agnew says limits in countries like Canada and the United States are much higher. Belgian Soclialist Marc Tarabella says he thinks the changes made by the internal market committee are "well balanced". But Polish MEP Edward Czesak says the "stringent norms" proposed under the rule change will increase costs for producers and put jobs at risk. It can not be expected that farmers in all EU countries will be able to immediately move from man-made to natural fertilisers, he adds. Migration commissioner Dimitris Avramopoulos says increased promotion of fertilisers made from recycled products will make the sector less dependent on imports. It will also create new markets for technology providers - which he calls a "win win". He says people in Europe are "far too exposed" to the chemical cadmium and the EU has a "golden opportunity to lead the world" in reducing levels in fertilisers. Calling for the industry to work with the EU, he says agrochemical firms will be able to gain an advantage in the development of new technologies. MEPs are now debating new rules for selling fertilisers made from recycled products, included as part of an update of EU approval rules. The rule change has been proposed as part of a wider drive to boost recycling. Under the plans announced last year by the European Commission, there will be further limits on the amount of cadmium allowed in phosphate fertilisers. The internal market committee has proposed that the limits should be tightened even further. MEPs will take an initial position on the rules tomorrow ahead of talks with national ministers. There’s another timetabling request from Ska Keller, who asks for Wednesday’s debate on a new border system for the Schengen area to be postponed. She says a report to be published tomorrow will cast doubt on whether the plan is in line with EU law. The idea is rejected on a show of hands, meaning the debate will go ahead. MEPs also rejected a request to move a debate on forest fires in Spain and Portugal forward from Wednesday evening to the start of the afternoon. Green/EFA group co-leader, German MEP Ska Keller, requests that tomorrow evening’s debate on sexual abuse is followed by a vote on a motion at the next plenary sitting. Dutch Liberal Sophia in’t Veld asks for the debate to be moved from tomorrow evening to a more prominent place on Wednesday morning. It follows a number of allegations made against MEPs in news reports over the weekend. Both requests are approved - meaning that the debate will now take place on Wednesday morning. It will swap places with the debate on existing legal exposure limits to workers for hardwood dust and vinyl chloride monomer, which will now take place tomorrow evening. At the request of European Parliament President Antonio Tajani, MEPs observe a minute’s silence to remember those who died in forest fires in Spain and Portugal over the summer, and those who died in Ireland as a result of hurricane Ophelia. Welcome to live coverage of today’s plenary sitting of the European Parliament in Strasbourg, which will be getting underway shortly. The sitting will kick off with administrative announcements, after which MEPs will have the chance to request additions or changes to this week’s agenda or make points of order. Proposals to add a debate to the agenda have to be made to the President at least one hour before the sitting opens, and can be tabled by one of the Parliament’s committees, one of its political groups, or a group of 38 MEPs. 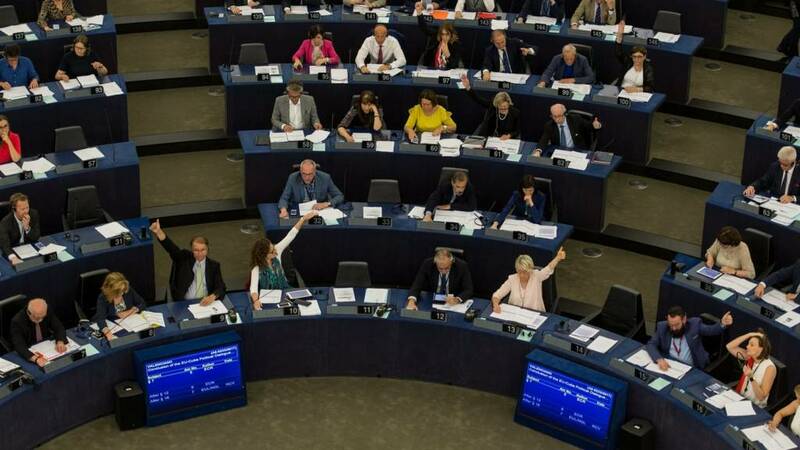 In order to be formally added, an item must have the approval of a majority of MEPs – this can be shown via a show of hands.